Dr. Pauls Piggy Paste Review – Does this work to clear up Nail Fungus? Nail fungus is a fungal infection of one or more of the nails on the fingers or toes. These infections typically begin as a yellow or white spot underneath the tip of the fingernail or toenail, and then progress deeper into the nail. They can cause the nail to discolor, thicken, and even crumble at the edges. Fungal nail infections are often difficult to treat and may recur following successful treatment. Many over the counter (i.e., non-prescription) anti-fungal treatment options are available, however some are not very effective at treating true nail fungal infections. 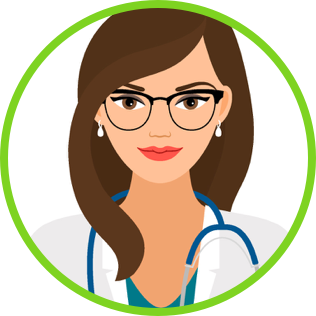 Oral prescription medications, such as Lamisil and Sporanox, can be an effective means of treating fungal nail infections as well as tea tree oil, but treatments can take as long as four months to fully work. Other treatment options include a prescription antifungal nail polish called Penlac, however this make take up to one year to show improvement. In addition, some topical medications may be used along with a prescription medication. A recent addition to the market of over-the-counter nail fungus treatments is a product known as “Dr. Paul’s Piggy Paste.” This product is not touted as a means to treat the fungal infection itself, but rather as an easy way to improve the appearance of toenails that have been thickened and discolored by the presence of nail fungus. According to an article published in May of 2010 in the Bloomington, IL newspaper Pantagraph, the physician-inventor of Dr. Paul’s Piggy Paste – Dr. Paul Kinsinger – concedes that the product cannot be touted as a treatment for toenail fungus, citing the fact that Piggy Paste has not been through the clinical trials needed to substantiate such claims. However, he does use anecdotal evidence from use in his own medical practice – as well as sales of the product – to support his assertions that the product works to improve the appearance of nails affected by fungal infections. The concept for Piggy Paste originated from Dr. Kinsinger’s experience with the well-known historical practice of soaking toes in a solution of half vinegar (acetic acid) and half water for approximately five minutes a day for nine months, which has anecdotally been shown to clear up toenail fungus. Realistically speaking, however, most people who suffer from toenail fungus do not have the time to devote to doing this every day. So, Dr. Kinsinger simply decided to make the process easier. He worked with a compounding pharmacy to develop a product that delivers the vinegar to the toe in an easily absorbable paste. He then worked with the pharmacist to finalize the formulation for individual prescriptions. Dr. Kinsinger recruited more than 100 of his own patients who had toenail fungus to apply a pea-sized amount of the paste to each affected nail and cuticle once per day, and then cover with a bandage for a minimum of two hours. According to Dr. Kinsinger, 81 patients saw their nails clear within three to four months and new nails grew in without fungal spores. It is important to note that Piggy Paste is not specifically marketed to treat the nail fungus itself, only to improve the appearance of affected toenails and new nail growth. Accordingly, there are no conventional anti-fungal ingredients in Dr. Paul’s Piggy Paste, such as those commonly found in over-the-counter antifungal medications (e.g., terbinafine [the active ingredient in topical Lamisil]). 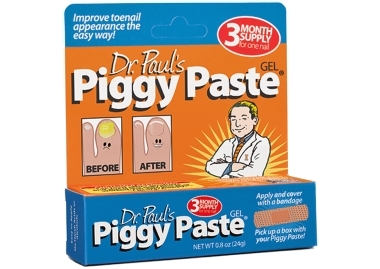 As listed on the product’s website, the ingredients in Dr. Paul’s Piggy Paste include: propylene glycol, ethoxydiglycol, acetic acid (vinegar), thymol (a common ingredient in mouthwash), hydroxypropylcellulose, dimethyl sulfoxide (DMSO), menthol-USP, and butylated hydroxytoluene (BHT). Acetic acid, thymol, and menthol appear to be the active ingredients, with DMSO acting to deliver the ingredients to the nail bed, and the remaining ingredients present to provide the paste-like medium. When fungus invades a nail, it alters the pH balance of the nail and surrounding skin. The acidity of vinegar helps to restore the pH balance to more natural levels, as well as to relieve the itching and pain caused by the fungal infection. Since the fungi that frequently infect nails do not like acidic environments, the vinegar essentially creates an environment that is no longer hospitable to the growth of the fungus and ultimately halts the growth and spread of the fungus. Thymol is the primary essential oil from in the herb known as thyme. Menthol is an oil-based extract from mint plants. Both thymol and menthol have antibacterial and antifungal properties, and are common ingredients in over-the-counter medicated chest rubs such as Vicks® VapoRub®, as well as a common ingredient in toothpastes and mouthwashes. Their antibacterial and antifungal properties have fostered their reputation as effective ingredients in products designed to treat nail fungus. Numerous anecdotal and layman’s reports have testified to the effectiveness of thymol, menthol, and medicated chest rubs in general, as a means of treating fungal nail infections. The scientific literature also lends some support for their use. For example, a 2003 study by Ramsewak et al. investigated the effectiveness of a medicated chest rub similar to Vicks® to prevent the growth of fungal nail infections. They found that both thymol and menthol were two of the most effective ingredients at preventing the growth of the fungi that were studied. In Dr. Paul’s Piggy Paste, the combination of acetic acid, thymol, and menthol – with their ability to restore pH balance to the nail and kill existing fungal spores – likely work together to enable the new nail to grow out clear and free of fungus. Propylene glycol has many uses; however, in the medication and cosmetics industry it is typically used to maintain moisture and is also used as a solvent. Ethoxydiglycol is a cosmetic-grade solvent that is used in many skin care preparations as a carrier for active ingredients. Hydroxypropylcellulose is typically used as an ingredient in prescription artificial tear compounds designed to treat insufficient tear production and other eye problems. It can also be used as a thickening agent and as an emulsion stabilizer. Dimethyl sulfoxide, or DMSO, is a natural byproduct of the wood industry. When used topically, it can help to speed wound healing, treat inflammation, and toenail fungus. Although it does not, however, have antifungal properties, DMSO is incredibly penetrative and helps to drive anti-fungal medications down into the nail bed and surrounding tissues. It is likely that it plays this role in this formulation of Piggy Paste. Butylated hydroxytoluene is an antioxidant compound typically used as a fragrance in cosmetic products. Ramsewak RS, Nair MG, Stommel M, Selanders L. In vitro antagonistic activity of monoterpenes and their mixtures against ‘toe nail fungus’ pathogens. Phytother Res. 17(4):376-379. ← Nail Fungus Sufferers: What Works and What Doesn’t? I am an older person, and do not have nail fungus. . . . . just thick toenails. Will this Piggy Paste make my nails grow in more like normal nails. Many of my friends nails thicken as they age. I used this product for several months and in the end it did not work. After some initial improvement, the discoloration returned during the treatment. I was getting good results with tea tree oil when a friend gave mw some Piggy Paste. While the Piggy Paste was a title messier with the bandaid and all, I just did it at bed time. Be careful though, as leaving the bandaid on over night ….especially if you are generous with the paste may be too much. I did lose a little skin early in the game…but maybe that is what had to happen to get rid of all the fungi. The Piggy Paste really did speed up the process. As a “paste” the “ingredients” don’t really make their way into the areas where needed. You are better off using a liquid-based formulation, even just using vinegar. A much better formulation is thymol in chloroform, which delivers the thymol up into the nail They $30 charge for 0.8 oz. Unfortunately, this is pretty much snake oil for an uncurable situation… But good for Dr. Paul for making a few bucks!